Make Space Yours Arrives at Its Final Destination! We’ve been talking to you guys a lot about Omar Samra’s initiative, Make Space Yours, and we’re glad to see that the competition reached its final stage on the 8th of February. Make Space Yours was founded on the dream of reaching space, encouraging younger generations to literally reach for the stars, sparking a future generation of dreamers who have their eyes set on space. Through space competitions, the Inertia-powered initiative attempts to raise awareness about space, and educate younger generations. The concluding stage included the final tests that were set to truly evaluate the capabilities of the young participants. 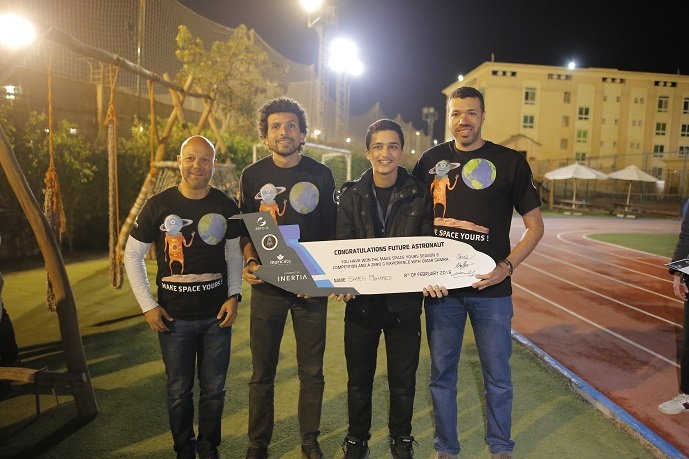 While all finalists have been awarded a ticket to the Make Space Yours Camp, plus a flying experience at Aerodium Egypt, Sameh Mohamed, the older age group winner, is the lucky recipient of a very special prise: a zero-gravity flight in US or France with Omar Samra himself. In Ancient Egypt, the Pharaohs were very much in tune with space science, and in today’s modern Egypt, we have examples such as Omar Samra with his initiative, and Mohammed Sallam who’s among the finalists to become a Mars One Astronaut set for a one-way ticket to Mars. Make Space Yours can inspire many more people in the future. Make Space Yours in 2016 and 2017 was all about raising awareness; Omar Samra journeyed around schools and universities in Egypt, delivering talks in 77 schools and 44 universities in the two years. Camp 101 was held during the Rise Up Summit 2016. Here’s to many more future editions of this wonderful initiative!